The APA Louisiana Chapter Planners4Health project was a wonderful exercise in beginning to examine and understand the connection between planning and health in Louisiana. Planners4Health has set the table for future engagement and collaboration around health and planning in Louisiana. In future years, we envision planners and health practitioners leading and supporting conversations, plans, projects, and initiatives that result in healthier communities in Louisiana. In 2017, we saw the benefits of this work in a very important planning process. The backbone of public transportation in New Orleans, the St. Charles Streetcar began providing service in 1835. There is a long, rich history of public transportation in New Orleans, and today the city has a multimodal transit system of streetcars, buses, paratransit vehicles, and even several river ferries. Unfortunately, Hurricane Katrina in 2005 devastated the system. While service has slowly recovered, recovery has not kept up with the population. According to Ride New Orleans, in 2016 the system provided less than 55 percent of the trips provided before Hurricane Katrina. Reflecting on this statistic — and examining the changing demographics and land use patterns of the city — residents, transit users, and community leaders acknowledged that the transit system in New Orleans has a lot of room for improvement. Ride New Orleans is a nonprofit policy and advocacy organization with a vision of a world-class, multimodal transportation system that promotes a vibrant, healthy, and sustainable New Orleans region. Since 2009, Ride has advocated for the New Orleans Transit Authority (RTA) to conduct a planning process to create a long-term vision and plan for transit in the New Orleans region. 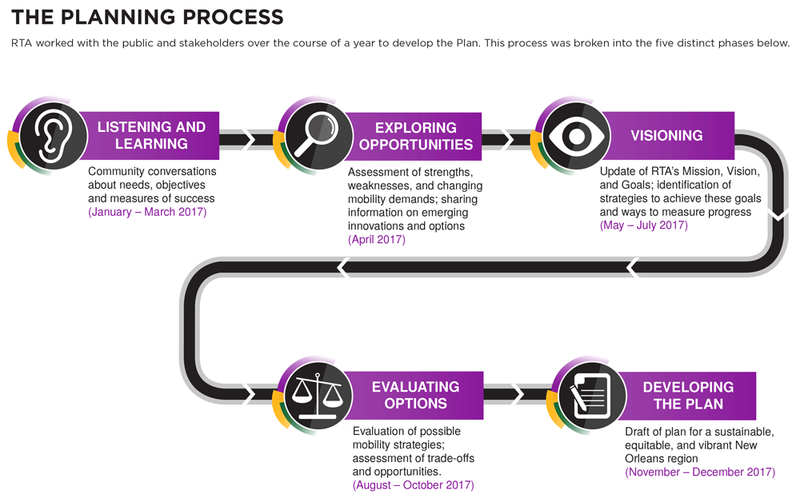 In 2015, the RTA board began the process of hiring a consulting team to create a plan, and in early 2017 the planning process officially began to develop the Strategic Mobility Plan (SMP). Among the stakeholder groups, Ride New Orleans took the lead in engaging in the planning process. The Louisiana Public Health Institute (LPHI) was among the other stakeholder groups watching the process. LPHI is a New Orleans-based public health nonprofit institution with a long and distinguished history of engaging communities and supporting public health. Reception of these goals was generally positive, however, none of the goals and associated strategies truly addressed how transit can impact health. Supported by members of the task force, LPHI met with Ride to determine a strategy on how to bring a health focus to the plan. With Ride supporting LPHI, LPHI developed recommendations to address health and transit. Additionally, LPHI was added to the invite-only SMP advisory committee (Ride had representation on the committee). Graphic from the New Orleans RTA Strategic Mobility Plan shows the planning process. LPHI gaining a seat on the advisory committee was an integral step in determining how to address health in the framework of a long-term transit plan. The advisory committee, which included RTA staff, various city agencies, and the Riders Advisory Committee, was the place where many of the key plan and policy discussions were conducted. After months of work and engagement, a new goal with additional strategies, actions, measures, and targets was added to the SMP – Support a Sustainable Healthy Region. The final plan was presented to the RTA board for official approval and adoption in December 2017, and both Ride and LPHI will continue to be at the table to make sure that the plan is approved and to ensure that RTA uses the plan in make future transit decisions. We believe this is a tangible result that shows how health can be effectively integrated into planning projects. Without Planners4Health and the individual and policy connections that brought Ride and LPHI together, there was a chance that the planning process may not have resulted in health goals and metrics added to the SMP. As we move forward, LA APA will use the SMP as an example of identifying organizations (and individuals) to develop additional partnerships around health and planning that have the potential to positively impact our communities in the State of Louisiana. Top image: New Orleans streetcar. Photo by Flickr user Paul Sableman (CC BY 2.0). Fred Neal Jr., AICP is the project manager for the Louisiana Planners4Health Task Force and a senior planner with Villavaso and Associates. In addition, Neal is one of the founders and the president of the board of directors of RIDE New Orleans and a board member for Make Music NOLA, a nonprofit organization that provides music training to eligible students in New Orleans.